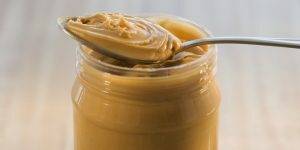 A new study found that sniffing peanut butter has proven to be a useful method in determining whether the Alzheimer’s disease will be upon the sniffer. And because sense of smell is often the first sense to experience cognitive decline, this peanut butter smelling tests appears to be extremely useful in handling Alzheimer’s. Researchers at The University of Florida conducted a study that asked over 90 participants to smell a spoonful of peanut butter held not too far from their nose. The ending results of the study concluded that some of the participants had a confirmed early stage Alzheimer’s diagnosis, some had other types of dementia, while the rest had no cognitive or neurological issues. The participants who struggled to smell the peanut butter were the ones who were diagnosed with early onset Alzheimer’s. What was particularly remarkable was that these participants were able to smell it with their right nostril a lot easier than with their left. The right nostril was able to smell the peanut butter 10 centimeters farther away than the left nostril. Although, this method appears to be efficient, many neurologists are not on board with it. Neurologists Dr. David Knopman from the Mayo Clinic is one of many who expresses concern that such a simple process can diagnose such a complicated disease. He also doubts the test’s capabilities because it cannot differentiate between the different types of dementia. Recent research has found that there is in fact a strong correlation between the failing sense of smell and an early signs of Alzheimer’s. Researchers from the Mayo Clinic in Rochester, Minnesota found that seniors who had the worst test scores on a smell test were 2.2 times more likely to show signs of mild cognitive decline. Additionally, if participants were already exhibiting memory problems and obtained low smell test scores, they were more likely to progress to Alzheimer’s. Why is this relevant to the class? New technologies and methods are always interesting because they affect how businesses and consumers behave, especially when talking about diseases. Although this is very new and is still in its developing stage, this will eventually affect social behavior. How would you feel knowing an ingredient in your kitchen cabinet has the power to diagnose you with Alzheimer’s? How would you feel if you sniffed the peanut butter and was not able to smell it? Will this easier method help to catch Alzheimer’s symptoms at a much faster rate leading to its cure a lot sooner than we think? I believe it is important that more research is conducted before citizens go about diagnosing themselves with their kitchen ingredient. I am really interested in seeing how this will play out and whether this method proves to be accurate in its abilities to diagnose Alzheimer’s.